Send Mother's Day flowers and gifts to Philippines from anywhere around the world. Your Mother and other loved ones who are mother's, too (sister, friend, wife) will surely appreciate the thought when they receive the delivery of fresh flowers you sent on Mother's Day especially if you are far away in other parts of the globe. A bouquet of 1 dozen pink roses with pearls is a perfect gift for mother's day. If you are undecided whether Mother's day occasion calls for something really dramatic or just charming, you cant go wrong with the versatility of pink roses and white pearls. At an affordable price of only $75, this gift package consists of only the freshest 1 dozen pink roses of excellent quality, wrapped elegantly and enhanced with a sophisticated accent of white pearls. This gift package is ideal for Mothers Day, Anniversaries, Birthdays, and occasions for Roses. You can smell it in the air, see it in colors and curves everywhere? Christmas is approaching. Send your Yuletide wishes with this gift package priced within budget at only $88. It consists of assorted flowers like liliums, roses, gerbera, and mums arranged with assorted fruits like grapes, bananas, oranges, apples, and grapes in a pretty basket with Christmas ribbon and accents. This gift package is ideal for occasions for Fruits and Flowers, Mothers Day, Get Well Soon and Christmas. Send your most inspiring well wishes with flowers that exude qualities for self enhancement. Gerbera signifies cheerfulness, lilies for elegance and carnations for fascination and devotion. Priced reasonably at only $68, this gift package consists of assorted flowers like gerberas,roses, alstomeria and carnations of only the freshest, excellent quality, in an elegant tall vase. This gift package is ideal for Congratulations, Spring, and Mother\'s Day. Liliums stand for majesty, wealthy, and purity and gerberas are flowers of cheerfulness. Anthuriums symbolize the heart. 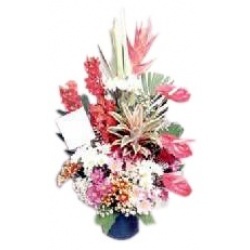 Send your warmest wishes with uniqueness with this exotic floral arrangement priced reasonably at only $88. This gift package consists of red lobster claw flowers, liliums, anthuriums, and gerberas of only the freshest, choicest quality. This gift package is ideal for occasions for Exotic Arrangements, Congratulations, Mothers Day, and Christmas. Anthuriums are symbols of the heart. Orchids are flowers of magnificence and mums are flowers of hope. Send your incomparable warmest wishes with this exotic floral arrangement priced within budget at only $80.This gift package includes anthuriums, orchids, and mums of only the freshest, superior quality, arranged elegantly in a classy vase. 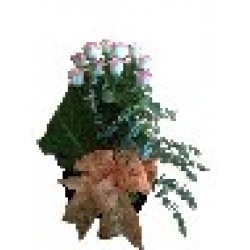 This gift package is ideal for occasions for Exotic Arrangements, Mother?s Day, Congratulations, and Christmas. Anthuriums symbolize the heart. Roses are flowers of hope while liliums signify elegance. Send your exceptional wishes with this exotic floral arrangement that includes only the freshest, excellent-quality anthuriums, roses, and liliums arranged elegantly in a vase, all priced reasonably at only $78. 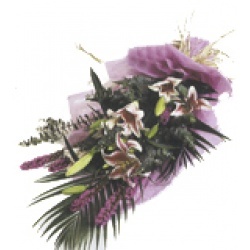 This gift package is ideal for occasions for Exotic Arrangements, Christmas, and Mother's Day. Bring health and happiness on the table, and save the gourmet for another day. 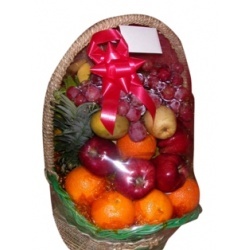 Send your warmest wishes with this fruit basket priced reasonably at only $75. This gift package includes only excellent-variety assorted fruits like apples, oranges, grapes, pineapple, pears, bananas, and mangoes, carefully vacuum-sealed to maintain their freshness. This gift package is ideal for Christmas, Get-Well-Soon occasions, Mother's Day and occasions for Fruits and Gourmet Baskets. Everyday is a reason to give your loved ones the gift of inner strength and well-being. 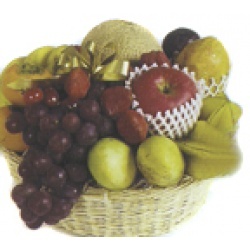 Send your heartwarming wishes with this fruit basket priced reasonably at only $68. It consists of only excellent-variety assorted fruits like apples, oranges, grapes, melon, pears, bananas, and mangoes ? 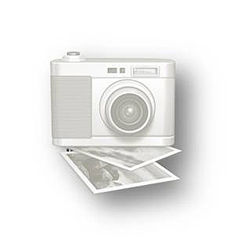 vacuum-sealed to maintain their freshness and quality. This gift package is ideal for occasions for Fruits and Gourmet Baskets, Get-Well-Soon occasions, Mother's Day and Christmas. 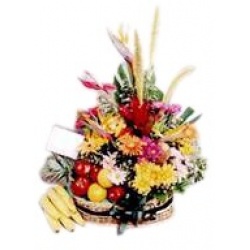 Send your sincerest wishes with this fruit and flower basket that goes for a budget-friendly price of only $75. This gift package includes only the freshest, excellent-variety assorted fruits and assorted flowers arranged beautifully in a fine-quality basket. Cheer up a loved one when she needs it most with a gift as precious as life itself ? your love. This gift package is ideal for Get-Well-Soon occasions, Christmas, occasions for Fruits and Gourmet Baskets, and Mothers Day. Send your sincere wishes with an arrangement of assorted fruits like apples, oranges, pineapple,banana, mangoes and grapes in a reusable basket with flowers like liliums and gerberas. Perfect gift for any occasions like Mothers Day, Birthdays, Get Well Soon and Anniversary. Make your loved ones happy with a perfect gift of flowers and fruits like grapes, apples, oranges, mangoes, pineapple and bananas arranged elegantly on a tray. Perfect for all occasions like Mothers Day, Get Well Soon, Birthdays and Anniversary. Your loved ones like moms, friends, wife will surely love this flower arrangement which consist of 10 stems colombian roses arranged in a vase with fillers and ferns. Perfect for any occasion like Mother's Day, Valentine's day, Birthdays, Anniversaries. Celebrate Mothers Day with an elegant spring arragement. 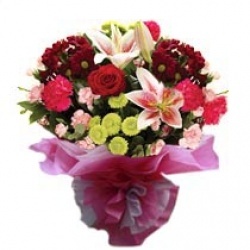 Consist of liliums, carnations and roses arranged elegantly in a vase. Perfect for any occasion like Mother's Day, Valentine's Day, Birthdays, Get Welll Soon. For that special someone who can completely light up every room she enters, nothing is more fitting than a beautiful shower of red roses and white pearls. Priced affordably at only $75, this gift package consist of only the freshest, premium-quality 1 dozen red roses arranged in a vase, enhanced with a sophisticated accent of white pearls. This gift package is ideal for occasions for Valentine's Day, Roses and Mother's Day. A perfect way to celebrate your Valentine's day, Mother's Day, Anniversary, Birthday with your beloved. A bouquet of roses and liliums wrapped elegantly and a bottle of champagne. A perfect gift for any occasion, an arrangement of 10 carnations which signify fascination, love and devotion. Enhanced with a sophisticated accent of white pearls and a matching bow. This gift package is ideal for birthdays, anniversary, valentines, christmas and mother's day. 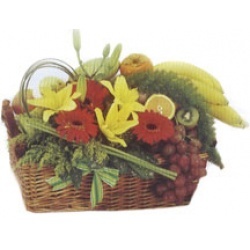 Consist of assorted fruits and flowers arranged elegantly on a basket. Perfect gift for Mother's Day.